Mr Kwesi Agyeman Busia, the Chief Executive Officer of the Driver and Vehicle Licensing Authority (DVLA), says only 61 per cent of drivers in the country are lawfully licensed and 60 per cent of vehicles on the road do not go through proper vehicle testing procedures. He said the situation was created by lack of robust licensing and registration regime as well as compromised road worthy certificates resulting in uncertified drivers and vehicles on the road, posing a threat to the national security. In addition, he said, the act of middle-men popularly called the “Goro Boys” had compromised the driver licensing administration, therefore, the new Smart Drivers Licence and Smart Vehicle Registration Card would help eliminate the fake driving documents from the system. This, he said, precipitated the introduction of the new products since the old licensing regime, which was introduced about 10 years ago had lost its value and relevance considerably. Mr Busia said this at the launch of the new Smart Drivers Licence and Smart Vehicle Registration Card, developed by the DVLA in Accra under the theme: “Transforming Driver and Licensing through People, Processes and Technology”. 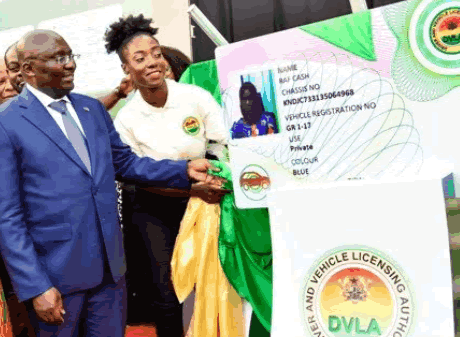 The new smart vehicle registration card and drivers’ licence have enhanced security features such as Transport Identification Number (TIN), which would enable the DVLA to authenticate the identity of users. Applicants can also apply online after which they would be given a date for testing and this will eliminate the middle-men popularly called the “Goro Boys” from the system. Mrs May Obiri-Yeboah, the Executive Director of the National Road Safety Commission (NRSC), entreated the DVLA to eliminate all administrative bottlenecks in the new licensing and registration regime in order to ensure effective delivery of services to the public. She gave the assurance that the NRSC would support the DVLA in sensitising the public on the new products saying road safety was a shared and collective responsibility. The Inspector-General of Police, Mr David Asante-Apeatu, said the Police Administration and the DVLA had a joint task force that checked compliance of road regulations; and gave the assurance that the Service through the Motor Transport and Traffic Department would work closely with the Authority to enforce the laws and improve compliance. Ninety per cent of deaths occurred in low and middle income countries which affected one to two per cent of their gross domestic products. In Ghana, nearly 2,000 persons are killed on the road annually due to the lack of robust vehicle registration and licensing regime.